This extremely rare “new arm” design Steinway & Sons Model B Grand Piano features an exceedingly rare Quarter Sawn Oak cabinet. Built in the New York Steinway Factory in 1901, this turn of the century vintage instrument is a stunning piece of art, both in case design and musicality. Steinway Model B grand pianos measure 6’11” in length and are the second largest piano now produced by the Steinway Factory in New York. 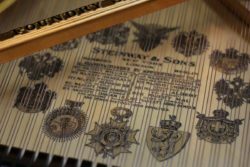 One of the most popular pianos ever built by Steinway & Sons, these pianos blend sound, size and tonal range into an amazingly versatile instrument. Many professional pianists consider these ‘seven-foot’ instruments to be the ‘perfect piano’ and choose them as their personal practice instruments. These pianos are perfect for the homes of pianists, studio recording, concert stages, places of worship and more. This piano has undergone an extensive rebuilding process to return it to a pristine, like new condition. New damper back action and much more! This instrument has been painstakingly restored to top concert standards. The piano’s action has been fully rebuilt with new German Renner wippens, and new hammers, shanks and flanges. A new custom keyset of the highest quality has been fabricated and installed. A new soundboard formed out of high grade, close-grained spruce has been installed along with a new hard maple pinblock. Our expert piano technicians have completed extensive action and tone regulation to ensure a responsive touch and a rich quality of tone. The piano features the broad tonal range expected of any concert level Steinway with a full bass and a treble section that sings with a bell-like quality. The golden era of piano manufacturing saw the crafting of some of the finest pianos ever built. Access to the finest materials and high-level craftsmanship helped the piano industry reach a peak level of perfection. This tradition of quality is one we are proud to carry on here at Chupp’s Piano Service. 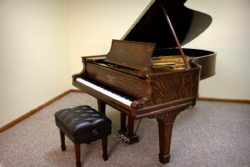 This unique instrument that is sure to be the musical centerpiece of your home or professional setting and is one of the finest pianos we have for sale today. This piano plays like a dream and you must experience it for yourself to truly appreciate the nuances in tone and its quick, responsive touch. Chupp’s Piano Service is an authorized and experienced installer for the Piano Life Saver System from Dampp Chaser. This advanced system is a combined humidifier and de-humidifier. The Piano Life Saver constantly monitors the humidity level and makes micro adjustments to ensure a stable environment for your prized instrument. 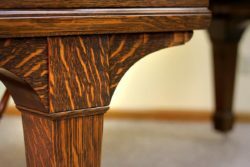 Here at Chupp’s, we have utilized these systems for years and we highly recommend you protect your priceless piano with one of these affordable systems. Our piano technicians are true experts in the art of action and tone regulation. We can adjust the action to ensure that it meets your personal playing preferences. We can utilize Genuine Steinway, German Renner or any other quality action parts you wish to use. Whether you desire a light or heavy touch or a bright or more mellow tone, we can craft the playing experience that is right for you. Learn more about the process here. Moving a piano requires expert care and attention to detail. With a typical piano weighing hundreds of pounds, it is essential that you hire experts to move your prized instrument. Chupp’s Piano Moving utilizes specialized equipment to ensure your piano is moved safely and securely. Unlike regular movers, we are piano professionals that understand how to safely and quickly move your piano. 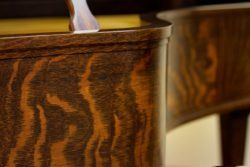 Because of this attention to detail clients from all over the country continue to select our beautiful pianos. Steinway Model B Grand Piano #558689 was built in 2001 at the New York Steinway Factory. This piano is in excellent, original condition and is ready for you to purchase and play. The piano's action has been expertly regulated and voiced to bring out a responsive, fluid touch and a powerful, rich quality of tone. Interested in this fine piano? Get in touch with our team today. Our piano rebuilding facility features a wide selection of used, new and fully rebuilt grand pianos for sale today. This piano has been sold to a client in Utah. Error: Error validating access token: Session has expired on Thursday, 10-Jan-19 19:00:02 PST. The current time is Wednesday, 24-Apr-19 23:40:39 PDT.